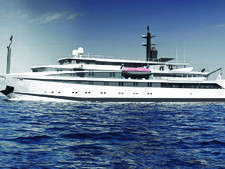 Sleek and almost futuristic-looking, Harmony V is a yacht-style ship in the small-ship fleet of Athens-based Variety Cruises. 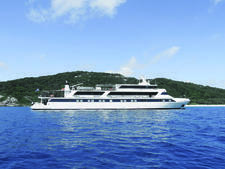 Delivered to Variety in October 2008, the 180-foot (55-meter) vessel was originally launched in 2003 but completely rebuilt in 2009 to accommodate the upscale market the line is attracting with its small ships and unique itineraries. 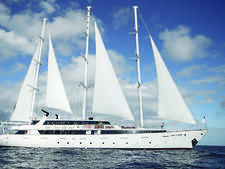 It can travel at a leisurely 11 knots, has dual stabilizers, and received a complete cosmetic and technological facelift. 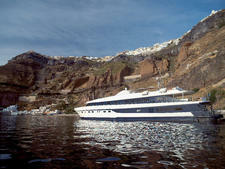 Harmony V has three passenger decks and capacity for 49 passengers. 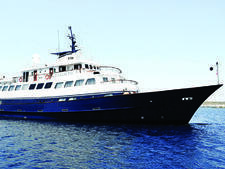 Harmony V's 25 outside-only staterooms have either windows or portholes, and they're sold in four categories: A (upper deck), B and C (main deck) are determined by location; the two P cabins (upper deck) are effectively junior suites with small seating areas that feature sofas that can each be converted to a third bed. The standard cabins average 135 square feet (12.5 square meters), which might seem cozy based on cruise ship expectations, but it's actually quite spacious for yacht accommodations. Staterooms are partially paneled in elegant, dark wood and offer individual climate control, Corian-clad bathrooms with showers and hair dryers, safes, flat-screen televisions, DVD players, minifridges and either large windows or portholes. Beds can be twins, doubles or queens; a few of the rooms have fixed bed types that cannot be changed. The sunny weather of the yacht's standard itineraries means a lot of time outside, whether it's on a sun deck lounger, at the outdoor bar or utilizing the water sports platform with its snorkeling equipment and kayaks. Indoors you'll find a large and comfortable lounge with an adjacent bar, a mini-spa and a dining room that offers meals in a single seating. Menu items reflect the cuisine of the region. Breakfast and lunch are served buffet-style, while three-course dinners have table service. Wines and cocktails are available at additional cost. All meals are fairly casual affairs with the trend being that one dresses a wee bit better for supper than for breakfast and lunch. Onboard entertainment is limited to the televisions in the lounge and in cabins (local channels only), as well as the available DVDs that passengers can borrow. Harmony V also offers Internet service on a limited basis. 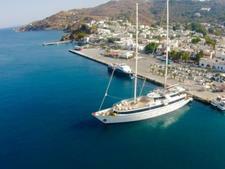 Ideally sized for the coves and coastline of the Greek Isles, the yacht sails from either Crete or Athens, from April to October, with itineraries that include staples like Santorini, Mykonos, Delos and Heraklion, even though the ship is also able to get into ports as diverse as Spetses and Kea. Winter finds Harmony V cruising the rivers of Western Africa (with Dakar-to-Dakar and Banjul-to-Banjul itineraries) and the islands of the Cabo Verde archipelago. A Cruise coordinator provides destination briefings and shore excursion information; on the ship's Western Africa itineraries, an onboard naturalist gives lectures. 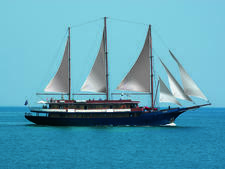 Passengers on Harmony V tend to be well-educated, well-traveled couples and singles, most older than 55, looking for soft adventure and historical perspective. They eschew the mob mentality of the larger lines visiting this region. The seven-night cruises also appeal to honeymooners and those who haven't quite retired from the business world and for whom a shorter vacation is ideal.